We have ROM chips and software upgrades in stock for most makes and models of pinball machines and several classic arcade video games. Everything from standard replacement chips, to the latest available upgrades, to special custom and "home" version ROM chips for some games. What is a ROM Chip Anyway? What is a USB memory key? Use the Search feature at top of the page to search by game name to see what ROM chips and updates we have for your game. For example, enter "Addams Family ROMs" to search for ROM chips for Addams Family. Not finding what you need? Drop us a quick e-mail. We no longer do an exchange program for ROM chips. ROM chips are now sold outright with no deposit, and no need to return your old ROM chips for exchange. Software updates sent out on USB keys or SD memory cards will have a deposit which is refundable if you return the USB key or SD memory card within 30 days of purchase. Return is optional- you may keep the USB key or SD memory card ifi you wish (many customers like to keep these for backups). But deposit will not be refunded if media is not returned within 30 days of purchase. Returned to us within 30 days of purchase only (no deposit refund is given after 30 days). The same USB key or SD memory card we sent to you for the update (no substitutes will be accepted). In good, clean, physical condition. In good working condition (no "dead" or otherwise non-functional media can be accepted). Returned by the original purchaser- we do not accept media from, or issue exchange credit to, anyone other than the original purchaser of the media. Deposits are refunded by the same payment method you used to pay with. If you have a ROM chip that you suspect is faulty or problematic, we can test it for you. There is a $10 minimum charge for ROM chip testing. This charge covers testing of up to 4 chips. Testing of additional chips is $2.50 per chip. If you wish to have your chip(s) tested, please call or e-mail us first, so we can verify what kind of chip(s) you have, and provide you with shipping address and other necessary information. Chips are shipped to us, and return-shipped to customer, at customer's expense. PLEASE NOTE: Package your chips properly before shipping to avoid damage and added replacement cost! Chips are very delicate and can be damaged if not properly packaged for shipping. See the next section for recommendations. If you're sending chips into us for testing, chips must be packaged carefully and properly to avoid damage during shipping. We are not responsible for chips that arrive damaged. We are not responsible for chips that arrive damaged! We do not and will not try to repair damaged chips or straighten out bent legs (they usually break when we do, due to metal fatigue/stress). If your chip(s) arrive damaged due to poor packaging, you will have to buy new replacement chip(s). Be sure they are packaged and secured properly before shipping. All ROM Chip sales are final. These are electronic parts that are not eligible for return, refund, or exchange. Software Updates on USB Keys and SD Memory Cards ("media") may be returned for deposit refund within 30 days of purchase, as described above. Any media received after 30 days from date of purchase will be refused- no exceptions. If you have a ROM chip or media that you suspect is defective, please see the Warranty & Replacement section below, before contacting us. If you ordered the wrong ROM chip, or an extra ROM chip that you ended up not using, we will not take them back. Electronic parts are not eligible for return, refund, or exchange. We supply only what you order, or ask us for, so we cannot be responsible if you order the wrong chip, or order something that you end up not using. Please verify your order before placing it, so you are sure of what you need. Shipping & handling costs for ROM chips and media. Customer pays for any and all shipping & handling costs, to and from our shop. Programming & handling service charges. This is minimum charge per media unit (covers labor and equipment costs) that is invested to produce the item you order, and cannot be reversed (or 'un-done'), so is not refundable. ROM Chip and/or Software Licensing Fees (if applicable). Some ROM chips we sell are licensed by the manufacturer and include a small fee paid to the manufacturer to cover the license cost and processing, which is not refundable. ROM Chips that were originally sent in to us for update only. Any ROM chips or media that are damaged in any way- internally or externally, physically or electronically. See the warranty & replacement section below for information on returning or replacing ROM chips or media that may be defective. All ROM chips and USB keys / SD Memory Cards ("media") that we provide are warranted against defects in workmanship and operation for 30 days from date of purchase only. Any shipping & handling costs to/from our shop. Damage from improper handling or installation on your behalf. Damaged ROM chips or media will not be accepted for exchange, credit, or refund. A new charge will apply for providing a new working replacement unit. Problems, defects, "bugs", or shortcomings inherent in the manufacturer's software pre-programmed on the ROM chip or media itself, or the way the software performs in your game. Software made for games is authored by the game manufacturer, and we have no control over it, or the way it behaves, once it is used in your game. ROM Chips or media found to be defective due to a fault of our own will be replaced free of charge, or a full refund will be given (less shipping & handling costs), if returned within 30 days from date of purchase, and unit is in fact verified to be defective due to a fault of our own (see below for more info). Units that are not defective can be returned to you, and an additional shipping charge will apply for the return shipping. Units that are defective, and that are found to be defective due to a fault of our own, will be replaced at no charge, and with no extra shipping cost to ship replacement chip(s) to you. We will not replace or ship replacement units for free that have been damaged and returned to us as defective (all ROM chips and media are tested before we ship to you). Return shipping is via First Class or Priority Mail- customer pays any extra costs if overnight or Express shipping is requested. NOTE: We apologize for any inconvenience this may cause, but about 99% of suspected "defective" ROM chips and media returned to us turn out to be fine, and problems end up being related to mishandling, misinstallation, improper removal/replacement of connectors or circuit boards, other existing issues in the game itself, or rare "bugs" that are occasionally discovered in some software, which we have no control over. We obviously cannot afford to provide and ship replacement chips at no charge when problems so frequently lie elsewhere in the game or with mishandling. We thank you in advance for your understanding. If you are uncomfortable with the replacement of ROM chips or media in your game, please consider enlisting the help of an experienced professional. You can find resources for help via our Game Service & Repair page. A ROM chip is a computer chip that holds the "software" or "computer instructions" inside your game. The software is what makes the game work, or play, the way it does. Just like your personal computer at home, pinball machines and video games also run on software. Instead of storing this software on a disk (like your computer does), games store their software on ROM chips. ROM chips can be easily removed and reinstalled (just like a floppy disk in your computer). Special programming equipment is used to read and write the software on the ROM chip. You can easily update the software in your game to a newer version (if available- see listing above). Chips are easy to remove and replace- instructions are available on our Technical Articles page. E-Mail Us if you have any questions on how to check the software revision currently in your game, or on changing/updating your game's ROM chip(s). Several brands of modern pinball machines use a USB or SD interface to upgrade their game software- ROM chips are no longer used on these systems. A USB memory key or SD memory card is used to install the updated software into the game's system. USB memory keys (or "flash drives") are used on personal computers and are basically the modern day equivalent to the floppy disk or a CD-ROM. SD memory cards are often used in devices like digital cameras and cell phones. Not all USB memory keys are compatible with the Stern S.A.M. system games. USB memory keys that we sell and ship are correct types, and are compatible with the new Stern games. All USB key updates and SD memory card updates that we send out include step-by-step instructions for installation. If you want to update the software in your pinball machine, you'll first want to see what version of software you have in order to determine if a newer update is available, or if you have the latest version already. Most games will display software revision information in the display when you first turn them on, and while they are booting up. Some will display the information when you first put them into audits, or "test" mode, as well. Always check the above two items first. These games often did not have any software updates produced for them, but for those games that did, it's often difficult or impossible to tell what version is installed in the game. If you have any specific questions on these, please e-mail us for more info. Most of these games will display software revision information when you enter the "test", or "diagnostic" mode, via the buttons on the inside of the coin door. Turn game on and allow it to fully boot up and go into "attract mode" (game waiting to be played/started). Open the coin door and locate the 4 service buttons on the inside of the door, near the bottom. Press the "Enter" button momentarily. You should see the game's LCD monitor change and display the main menu screen. The current date and time will be shown in the lower right corner of the screen along with the version of software that the game is currently running. To exit the menu and return to attract mode, press the "Back/Escape" button inside the coin door, and close the door. Game and sound ROM information is displayed in one of the displays when you enter audits mode, via the buttons on the inside of coin door. ROM information is usually displayed on display during startup, or after entering audits/diagnostics mode via buttons on inside of coin door. ROM information is usually displayed on display during startup, or after entering audits/diagnostics ("Portals") mode via buttons on inside of coin door. Some late-model games may not show any software version information at startup- see the next section below for more info. ROM/software revision information may or may not NOT be automatically displayed on the score display during startup- depending on the exact game/model. If your game does not show the software version info at startup, turn the game off, and hold the RIGHT flipper button in while you turn power back on, and continue to hold, and the game will show software revision information as it boots up. These games, also, rarely had any software updates produced. E-mail us if you need more info. Revision info is usually displayed by entering "test" or "diagnostic" mode, via buttons on inside of coin door. Some later model games with dot-matrix displays may show revision information on display during startup. If you have any questions or problems determining the software versions in your game, feel free to e-mail us. Some games originally intended for overseas (outside the U.S.) destinations had special ROM chips installed at the factory for foreign (non-English) language. To change such a game back to English language, you may need to replace some ROM chips, or make some software/hardware adjustments, depending on the type of game. Usually just the game and/or display ROMs need to be changed. Sound ROMs were usually always in English and do not need to be changed, in most cases. Most non-English chips will have an identifying letter as part of the software revision information on the chip label. For example, a German language chip might be labelled "G4.01", or "LG2", whereas an English (American) chip would be labeled "A4.01", or "LA2", etc. Click here for information on determining software revision information in your game, or e-mail us if you have any questions. NOTE: You can always look up a full listing of available chips, by game name, in our listing above. Each game's listing will show all available chips we carry for that game, along with revision information, where available. Online ordering is also available there. Most games prior to 1985/1986 did not have language-specific ROM chips installed, so no need to change these. There were a few exceptions- such as some games that used foreign-language speech ROMs.) If you have any questions on a specific game, feel free to e-mail us. Game ROM U2 and/or U3. Sound ROMs do not need to be changed. 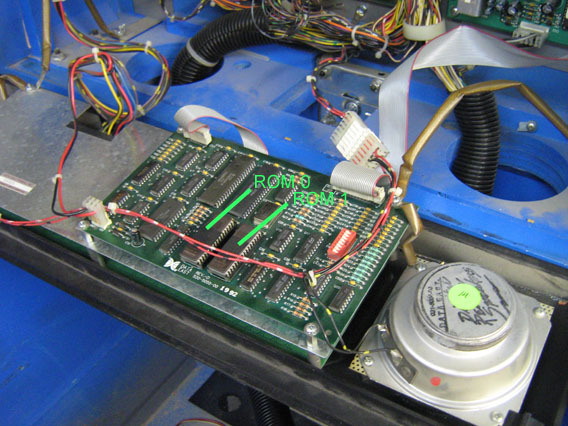 Williams took over Bally pinball in 1989 and still manufactured games under the Bally name, but often used Williams circuit boards and hardware. See "Williams Pinballs 1985-1990" below for more info. See "Williams Pinballs 1990-1999 (WPC MPU)" below. Most Data East games require changing both game ROM and display ROM chips. Some games may use just one chip for game or display- others may use two. It depends on the game. Game ROM B5 and/or C5. Sega took over Data East pinball, so most early Sega games were the same configuration as late Data East. Stern Pinball took over Sega pinball and earlier Stern Pinball games had the same configuration as late Sega games did. Later-model Stern Pinball games now use a USB memory key to upgrade the game software instead of ROM chips. The Williams System 11, 11A, 11B, and 11C MPU board uses two language-specific chips- U26 and U27. Note that some of the first early System 11 and System 11A games (click here for list) will only require a jumper to be changed on the MPU board in order to switch between two languages, such as German and English, and may not require ROM chip changes at all. On these games, jumper W7 is removed (clipped) for German language. Jumper W7 is installed for English language. Jumper W7 is located near chip U49- between the flipper relay and battery holder on the MPU board. See the Locations of ROM Chips section below for details, and a picture indicating exact location of the ROM chips and W7 jumper. You can find and order replacement ROM chips by looking your game up in the listing above. Bally and Williams games of this era were both manufactured by Williams Electronics, and used the WPC MPU board. 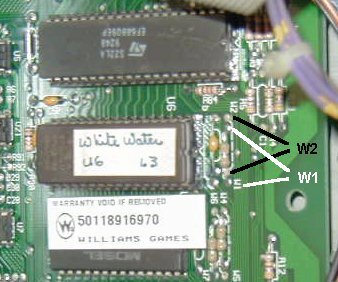 Most WPC games do not require ROM chip changes to change the language. Language is selectable through the game's menu system- software adjustments/settings. And also by way of jumpers or DIP switches on the MPU board (for "default language"- see below). A select few (less than 5 or 6) of these games actually have versions of some chips (game AND sound ROMs) that are foreign-language-specific (non-English). Some that use these are WhoDunnit and World Cup Soccer. There may be others. If you have one of these games, look them up in the listing above for further details. Most Bally/Williams WPC games will have the desired language selected in the game's software settings/adjustments. Refer to your game manual for the exact information on this. These games also have a "default language" setting that causes specific language/options to be loaded/set when the game is initialized (by factory reset, ROM chip version change, or loss of memory (removal or drainage of batteries)). The default language is specified by jumper settings (early games) or DIP switch settings (later games) on the MPU board itself. There is a chart of jumper/DIP settings inside the front cover of your game manual that will show the specific settings for the default language of your choice. After changing these settings on your MPU board, you must perform a "factory reset" in the game's Utilities menu, or remove one of the batteries on the MPU board for a few minutes to clear memory, then re-start the game. The new default language settings will be installed at that point. All other memory will be cleared and reset (including audits, adjustments, settings, and high scores). Your game will also display a message stating "factory settings restored". Turn game off then back on, and everything should be back to normal, with your new default language installed. Some WPC games DO have language-specific chips (as mentioned above), but not many. If you have any questions about your specific game, see the listing above or e-mail us. Sound ROMs usually do not have to be changed, other than for some specific games, as mentioned above. The MPU board is the large board located in the top center area of the backbox in System 11 games. The MPU board has a battery holder with 3 x AA batteries in it, which is located near the top left corner of the board. 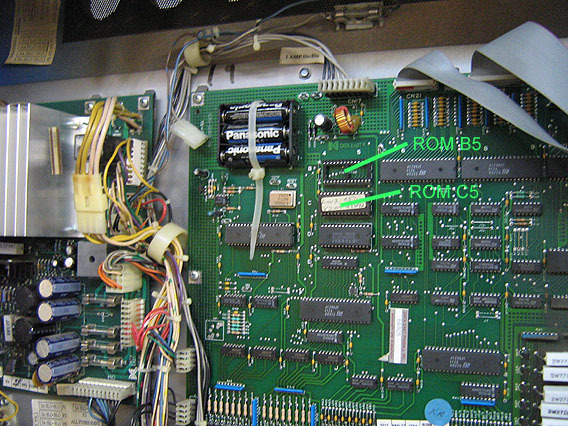 The MPU board contains locations for two game ROM chips (B5 and C5). These locations are just to the right, and below, the battery holder. A RAM chip, which looks similar to the ROM chip(s) is located just below ROM locations B5 and C5. Data East MPU board component locations are listed by alpha-numeric index- numerically across the top of the board, and alphabetically down the left side of the board. Most boards will have "B" and "C" printed in white ink to the left of ROM locations B5 and C5, respectively. Games with dot-matrix score displays will use one or two ROM chips, which are installed on the dot-matrix display driver board, located on the back side of the display/speaker panel at the bottom of the front of the backbox. The display/speaker panel must be lifted up, out, and layed-down in order to gain access to the back side of the unit, and the driver board located there. Two display ROM chip locations are present on the board, and should be marked with white ink on one end of each chip. These are locations "ROM 0" and "ROM 1". NOTE: Not all games will use both ROM chip locations on the display driver board. So don't be alarmed if you find one of the chip sockets empty. NOTE: If you are replacing TWO rom chips with ONE rom chip (or vice-versa), then you will need to make one jumper change on the display driver board in order for it to work correctly with the new chip(s). Click here for details. Action Pinball & Amusement, LLC, assumes no responsibility or liability for any problems, damage, or loss caused to you, your game, or your location due to faulty ROM chip(s), USB key(s), SD memory cards, or the software residing on these devices, or any improper use or improper installation of such devices. Devices provided by Action Pinball & Amusement, LLC, are used and installed at your own risk. Any warranty covers only the device itself. Warranty does not cover damage to you, your game, or your location, or any loss of profits or use. 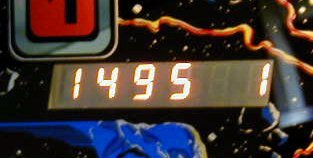 You assume full responsibility for any problems that may occur from use of devices from Action Pinball & Amusement, LLC. Prices charged for ROM chips, USB keys, and SD memory cards supplied by Action Pinball & Amusement, LLC, cover only the cost of the chip or media, and a service charge for handling. There is no charge assessed for the software itself which is programmed onto the chip. Software is property of the author. We do not own or sell any software- simply the chips or media upon which the software resides. Officially-released software that resides on chips that are sold by us, for use in Bally/Williams games, is distributed in accordance with Williams Electronics Games, Inc.'s Software License. We supply Genuine Bally/Williams Replacement ROM chips, by permission of Planetary Pinball Supply, Inc.
By purchasing a rom chip from us for use in your Bally/Williams game, you agree to the terms and conditions in the Williams Software License. Most manufacturer's copyrights require you to own the particular game you are obtaining replacement software for, so any media we provide with software residing on, are provided soley on that basis. We are not selling the copyrighted software- just the physical devices themselves that the software resides on, for use as replacement or upgrade in your game. In accordance with the Williams Electronics Games, Inc. Software License, we do not supply or distribute individual ROM images (data). E-mail requests for ROM images will be ignored and discarded. In accordance with copyright and distribution restrictions on chips of other/all manufacturers, we do not supply or distribute individual ROM images (data). E-mail requests for ROM images will be ignored and discarded.